Aquabest gives back to its community by having its own feeding-program. There's a saying that, there's more fun in giving than in receiving. Some prefer to share their blessing by giving donations in kind, donating used clothing, doing charity work, etc. 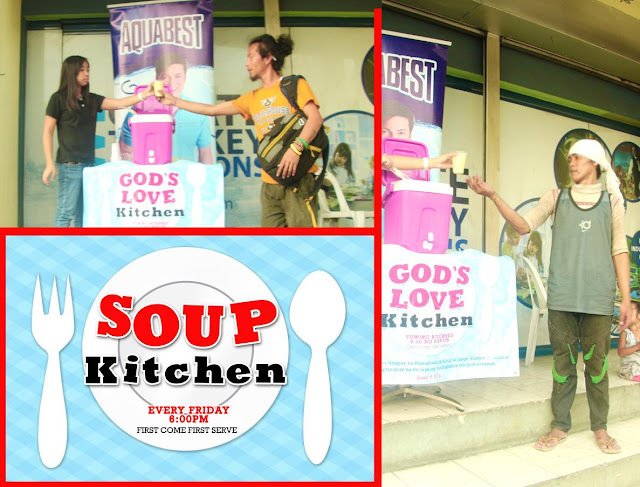 Every Friday afternoon, the Aquabest team operates a soup kitchen dispensing hot meals to the poor at its head office along Quezon Avenue. Since it started operating this February, the "Soup Kitchen" regularly serves dozens of under-privileged people. The soup kitchen is part of the company's efforts to give back to society and is a reflection of its moral values that underpin the company's operations. "As a company we have to strive to make a positive influence in our community. And our efforts here however small can help our underprivileged brethren that other people still care about them," says Carson Tan, AquaBest company's President and CEO. Helping others, no matter what their status in life is, should not be limited to a certain voluntary work. It can be anything. It doesn't require a protocol. The more we do it, the more it will be automatic. It's a feeling that can't be bought. A certain fulfillment that no material thing can replace. Having a mindset of looking after someone, thinking about their welfare even if you won't get anything in return, is already becoming extinct. What's stopping us from doing the right thing? The bigger enemy is...more often than not is yourself. Care to join us on the next episode of Soup Kitchen?